Financial planning assistance is important to anyone who wants to make informed money choices and achieve financial security. To make your money work for you, you need to set goals and create a comprehensive money management plan. However, you also need to ensure that you take steps to protect your assets, take advantage of tax breaks, and protect your legacy. How does financial planning assistance work? What should be involved in my financial plan? How can a St. Louis financial planning assistance lawyer help me? The type of financial planning assistance that you receive should be geared towards achieving your goals and should be appropriate for your life stage. A person just starting a career is going to have very different needs than someone who is nearing retirement and who has built up a substantial nest egg. This is why it is so important for each person to talk with a qualified professional about their own situation. When you get help with financial planning, your attorney should first assess your current financial situation and should then discuss your goals with you. Your lawyer will ask you questions about your short and long-term goals to get an idea of what you want to achieve with your money. Once you have defined your desires for financial security and wealth building, your attorney can help you to create a personalized plan. The focus of financial planning assistance is not just on maximizing your savings, setting financial goals, and achieving them. You also need to make sure the wealth you are building is protected, kept safe during your life, and able to be handed down to the next generation. Opening and investing in tax-advantaged accounts. IRAs and college savings accounts for your children can provide you with substantial tax savings because, depending upon the account, you could invest with pre-tax dollars or you could invest in accounts that allow for tax-free growth and withdrawals. Setting goals for savings. Your attorney should help you to decide how much to save in each account each month or each year to accomplish your financial goals. Automating savings may be the best way to ensure that your goals are met. Protecting assets. You may be able to use trusts to secure protection for your wealth. Trusts could ensure your assets don’t have to be spent down or property sold before you get Medicaid to pay if you need to go into a nursing home. Trusts can also be helpful if you are concerned your heirs will waste your money or squander assets after you pass away. Creating a plan for incapacity. By creating a power of attorney and/or a living trust, it is possible to ensure that your assets are kept safe even if you become incapacitated and unable to manage them on your own. These are just a few of the many things which may need to be a part of your financial plan. An experienced St. Louis financial planning lawyer will create a customized plan tailored to helping you achieve the financial security you have been dreaming of. 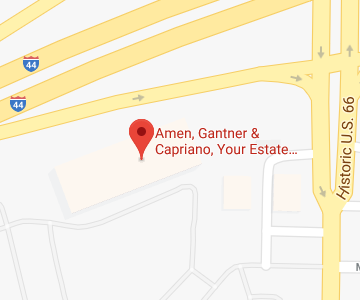 When you are ready to make sure your money is working for you and to take advantage of the legal tools to help you grow and protect your nest egg, contact Amen, Gantner & Capriano – Your Estate Matters, L.L.C. at 314-966-8077 or contact us online. Our St. Louis financial planning professionals can offer you the advice and guidance you need to achieve financial security and build true wealth to change your own life and the lives of future generations. Give us a call today to get started.